A highlight of Sister Rita Bergamini’s 75 years as a Sister of Providence was serving as the first archivist of the former Sacred Heart Province. She delighted in reading voraciously, meticulously recording details in a tight, neat script, and sharing collected information with others. The archives “ministry of memory” encouraged her to develop the Bergamini-Lambruschini family archives with her late sister Yolanda in honor of their Italian immigrant parents. She was born in 1921 in Martinez, California, the youngest of nine children. She grew up in a home filled with classical music, which sparked a love that continues today. Educated in public schools, she took catechism classes from the Sisters of the Holy Family. Rita was a librarian and editor of the junior high school paper, and was valedictorian when she graduated in 1936. After high school, she enrolled at Providence College of Nursing in Oakland, California, graduating in 1942, and then was a registered nurse at Providence Hospital in Oakland. In 1943 Rita entered the Sisters of Providence novitiate at Mount St. Vincent, Seattle, 10 years after her sibling Evelyn entered. Sister Rita professed first vows in 1945. Sister Rita holds a bachelor’s degree from Seattle University and a master’s degree from Catholic University of America in Washington, D.C., both in nursing education, and a doctorate from the University of California, Berkeley. She served in ministry at St. Vincent Hospital, Portland, Oregon; St. Elizabeth Hospital, Yakima, Washington; St. Mary Hospital School of Nursing, Walla Walla, Washington; and Providence Hospital Clinical Unit, Seattle University School of Nursing. In 1961, she received a U.S. Public Health Service Nurse Research Fellowship Award. She was serving seven years as provincial secretary when a visiting Jesuit priest on the board of the National Archives Regional Center in Seattle explained how to organize the documents and historical items kept in a small storage area. 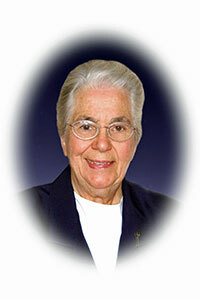 In 1972, Sister Rita suggested the creation of permanent archives. She became the keeper of the province’s history for the next 20 years and then for another seven years working with special projects in the archives. No longer in a formal ministry since 1999, her passion for preserving the sisters’ history never wanes. Sister Rita’s life at St. Joseph Residence today brings her joy. Gazing out her window, with classical music playing in the background, she can “observe absolute beauty”: the seagulls, the Puget Sound, the Olympic Mountains, the sunsets, the trees, the crows . . . She has time to read, to pray, and to participate in endless activities.